Want the same great listening experience at your favorite — but noisy — food spot every time you get together with family and friends? Options vary across different product lines, but some hearing devices offer a “restaurant” setting that cuts background noise, or you can create your own geotagged “memory” with sound settings tailored to specific locations for a consistent experience. When a room or other venue contains competing sounds, you need a way to focus on the audio you actually want to hear. You can use your hearing aid’s directionality function to focus the device’s microphones on the conversation in front of you, for example, versus the noise or other sounds behind you. 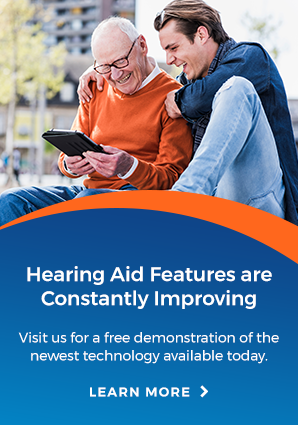 Some cutting-edge hearing aids not only offer great sound, speech clarity in noise, and audio streaming from your smartphone but also track brain and body health using artificial intelligence. With the Starkey Livio AI, for example, you control your programs, settings, and streaming while the Thrive™ Hearing app records your health data and provides three wellness scores, helping you track your fitness goals.